Circularity is one of the hallmarks of T’ai-Chi movement. Every element of the T’ai-Chi symbol is a circle or a part thereof. Since the name of this symbol is the same as that of the art, we expect that circularity is basic to T’ai-Chi movement. It should be emphasized that the stepping of T’ai-Chi movement is mostly along a straight line in contrast to Pa Kua Ch’ang (Ba Gua Zhang), which is an art for which all aspects of the movement are circular; namely, Pa Kua involves walking in a circle while rotating the body and circling the hands. Note that a circle is generally thought of as two-dimensional. In T’ai-Chi (and Pa Kua too), not only does the speed and radius of the circular motion continuously change but also its plane. Thus, it can be said that the circularity of T’ai-Chi movement is three-dimensional and constantly changing. 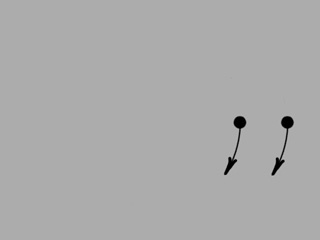 From a martial-arts point of view, an opponent can easily predict the trajectory of straight-line motion because it is unchanging in direction. By contrast, circular motion is constantly changing—especially when the plane, speed, and radius of that circular motion changes. That is, (a) one hand can be moving clockwise and the other hand counterclockwise, (b) the hands can be moving in circles of different radii and at different, changing rates, and (c) the plane of either or both hands’ motion may be different and changing. Thus the evolution of such circular motion is much harder to predict and, consequently, tends to confuse an opponent. Another aspect of circularity is that a lot of movement can occur in a small space. If done effectively, such movement can require an opponent to do large movement more quickly than humanly possible to prevent injury. Circular motion also involves a centrifugal effect, which can be used effectively. Consider the spin cycle of a washing machine. The constant direction change of wet clothing spun over many revolutions accelerates the clothing away from the water and, thus, helps in its removal. Alternatively, water could be removed from the clothing by accelerating it along a straight line, but that would require constantly increasing its speed in a basement miles in length. From a philosophical point of view, the constantly changing aspect of three-dimensional circular motion is quite in accordance with nature and with the Taoist underpinnings of the art of T’ai Chi. The following animations are from the perspective of the practitioner rather than an observer. Note: Keep in mind that these animations are two-dimensional, but the movements they portray are, in most cases, actually three-dimensional. 1. Parallel, Adjacent, Same-Diameter Circular Motion. This type of circular motion involves movement of both hands in separate circles of the same size and in the same direction and phase. Here, the hands move either clockwise or counterclockwise in separate circles of the same size, with one hand closely following the other (in phase). Click here or on the image below to view the animation. This type of motion of the hands is sometimes seen in “Rollback and Press” and counterclockwise in “Brush Knee,” but it occurs less often in T’ai-Chi movement (or, analogously, in music or visual arts) because it is simpler and not as interesting as the next six types of movement. 2. Movement of One Hand in a Circle and the Other in a Figure Eight. 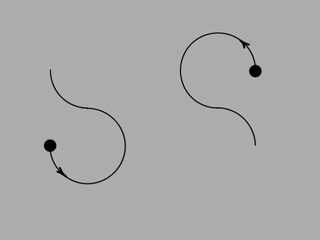 This type of motion involves movement in separate circles of different sizes, starting and ending together. It contains both the inner and outer components of the T’ai-Chi symbol. Click here or on the image below to view the animation. This type of motion of the hands is usually seen in “Rollback and Press.” It is much more interesting than the previous type of movement. 3. 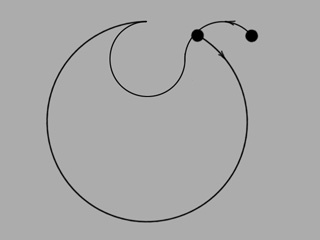 Movement in a Circle in the Same Direction but Out of Phase by 1/2 Cycle. 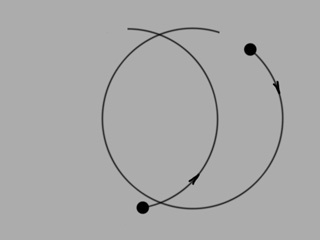 This type of circular motion involves hands both moving in the same circle, either clockwise or counterclockwise, with one hand a half cycle ahead of (or behind) the other (180° out of phase). Click here or on the image below to view the animation. 4. One-to-One Movement in the Same Circle, in Opposite Directions. This type of circular motion involves one hand moving clockwise and the other hand moving counterclockwise, both on the same circle. Click here or on the image below to view the animation. This type of motion of the hands occurs in a sagittal plane in “Brush Knee” and in a frontal plane in “Cloud Hands”. 5. Two-to-One Movement in Opposite Directions. This type of circular motion involves hands both moving in opposite directions at different rates. Click here or on the image below to view the animation. Note that when the dots cross each other, there is an optical illusion in which they appear to bounce off each other. To avoid seeing this illusion, use soft vision when viewing the animation. This type of motion of the hands occurs in a sagittal plane in the transition from “Brush Knee” to “Chop with Fist” in the long form. In this case, the left hand circles counterclockwise 170° during the time that the right hand circles clockwise 340°. 6. 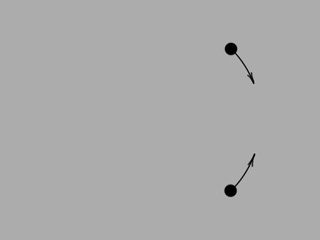 Circular Movement in the Same Plane and Direction but at Different Rates. 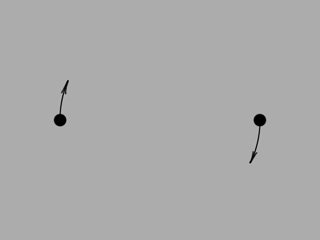 This type of circular motion involves hands both moving in the same direction, either clockwise or counterclockwise, with one hand moving faster than the other (here 5:2). Click here or on the image below to view the animation. This type of motion of the hands occurs in a sagittal plane in the transition from “raise Hands” to “Strike with Shoulder.” In this case, the left hand circles clockwise 120° during the time that the right hand circles counterclockwise 300°. 7. Movement in Opposite Figure-Eights. 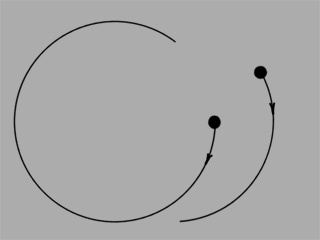 This type of circular motion involves hands both moving in opposite figure-eights. Click here or on the image below to view the animation. This type of motion of the hands occurs three-dimensionally in “Parting the Wild Horse’s Mane” in the long form.